For a complete list of climate headlines from 2005, see the December 2005 print issue. The reach of Hurricane Katrina expanded to the global climate change community almost immediately after the storm made landfall in New Orleans. Various groups, from climate researchers to environmentalists to policy-makers, hazarded the idea that as atmospheric temperatures rise from increased greenhouse gases, large hurricanes  such as Katrina and its successor Rita in the Gulf of Mexico  would become more common. Shortly before and after Hurricane Katrina hit the U.S. Gulf Coast in August, two attention-grabbing papers were published that examined possible links between hurricane activity and global climate change. The jury is still out on this connection, as many factors affect storm frequency and intensity. Image courtesy of NASA/MODIS Rapid Response Team at Goddard Space Flight Center. But its not that simple. The claims centered around two papers, one published the month before and one during the hurricane seasons spectacular climax. Kerry Emanuel of MIT in the Aug. 4 Nature and Peter Webster of the Georgia Institute of Technology and colleagues in the Sept. 16 Science independently examined sea-surface-temperatures and came to the conclusion that they could see climate change signals in large-storm intensity changes. Emanuel looked at changes across the globe since 1930, finding a correlation between changes in sea-surface temperatures, winds and major tropical storms (hurricanes, typhoons or cyclones). Worldwide, a marked increase occurred in the total energy released over the lifetime of major storms that could be classified as Category-4 or larger hurricanes, but not in smaller storms, as global tropical sea-surface temperatures rose. Websters team found more frequent intense storms, but only using global satellite data from the past 30 years. 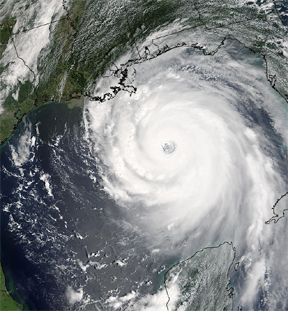 The authors of both papers noted that data have not been collected over enough time to make a definite connection between storms and climate change  and that specific events such as Hurricane Katrina cannot be attributed to global climate change. Locally, storms have declined in the north Indian Ocean and eastern North Pacific, Emanuel says, but these are specific regional responses, and global climate change does not happen the same way everywhere. The response to these authors observations was immediate and strong. Experts from the National Oceanic and Atmospheric Administration and elsewhere cautioned that drawing a direct link between climate change and hurricane behavior is not yet possible, and that the El Niño-Southern Oscillation may have more of an impact on storm intensity and occurrence. Hurricane experts pointed to increasing hurricane activity and sizes that they say run on a 20- to 30-year cycle, which led to a dearth of high-impact events in the North Atlantic during the 1950s and 1960s. Emanuel says, however, that the case for a cycle of hurricane activity is very tenuous, relying on landfall data in a specific region that is even less reliable than the global climate data. that clarify the issue of attribution of greenhouse gas effects on hurricanes. The only way to determine whether the link between global climate change and large storms is real will be with time. As melting in the Arctic seems to be accelerating, with ice conditions over the past 30 years plummeting, both in extent and thickness, researchers are making predictions that the Arctic Ocean will have ice-free summers before the end of the century. The likelihood of avoiding such a loss, they say, becomes smaller as other processes lock in conditions that will lead to more melting. 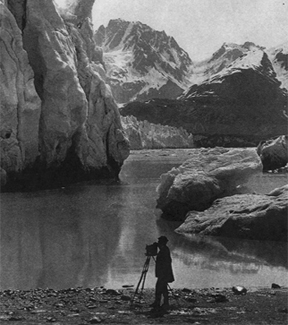 From 1891 (left) to 2005 (right), the terminus of the Muir Glacier in Alaska, which had once filled the entire fjord, shifted 50 kilometers to the north, leaving little ice left in the area  just one measure of climate change in the Arctic. 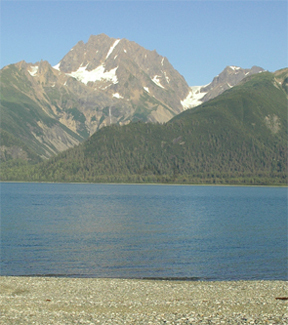 Photos courtesy of Archive at Glacier Bay National Park; Bruce Molnia. The extent of Arctic ice lost this year was the highest since 2002, according to data released Sept. 28 by the National Snow and Ice Data Center at the University of Colorado in Boulder, in cooperation with NASA and the University of Washington in Seattle. And over the past few years, sea ice  which generally reaches its lowest point in September  amounted to 20 percent less than the average recorded between 1979 and 2000, the report said. Another group of researchers, led by Jonathan Overpeck, director of the Institute for the Study of Planet Earth at the University of Arizona, Tucson, concluded that the Arctic will be iceless for the first time in a million years. In Eos on Aug. 23, they suggested that interactions between various factors (including permanent ice, ocean circulation and anthropogenic greenhouse gases) will push the planets ice systems outside the natural envelope of conditions in an interglacial period. Once outside the envelope, a warm Arctic is even less likely to recover its ice: The planet reflects less heat from the sun without its normal polar ice cover, and thus Earth will warm even more as the Arctic melts more. Recently, a research group has attributed warming in the Arctic to a sudden flood of warm water into the north polar ocean, as a byproduct of the North Atlantic Oscillation. According to Igor Polyakov of the International Arctic Research Center, at the University of Alaska in Fairbanks, and co-workers in the Sept. 9 Geophysical Research Letters, this warm water influx could further contribute to ice melt, as well as to atmospheric changes that also would lead to further melting. At the other end of the planet, researchers have logged both growth and shrinkage in Antarctic glaciers. Increased snowfall in the interior may be contributing to the East Antarctic ice sheets mass  which is increasing, according to research published in Science on June 24, led by Curt Davis of the University of Missouri in Columbia  potentially slowing sea-level rise. Measurements of glaciers in the West Antarctic Peninsula region show they are flowing into the ocean faster than snowfall can replenish them inland, according to Eric Rignot of the Jet Propulsion Laboratory, in Pasadena, Calif., and co-authors in the April 14 Geophysical Research Letters. If warming continues in the region, they wrote, the melt will contribute to sea-level rise. "Greenhouse gases revisited," Geotimes, Web Extra, Oct. 8, 2005.